In January of this year, Dee Campling and I were booked to present a workshop at the Houzz pop up event in Greek Street, Soho. 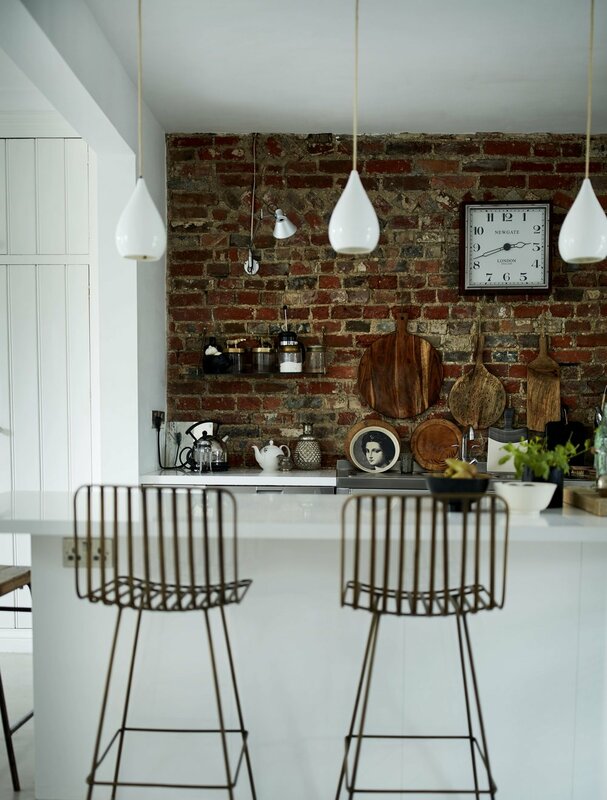 Houzz had taken over a five storey Edwardian townhouse and had worked with brands to design the interior. The end result was absolutely fabulous - by far the most exciting venue that Dee and I had ever worked in - and immediately inspired lots of ideas for our own homes. The living room and kitchen space was particularly amazing and the statement pendants in the room immediately caught my eye. The Cranton pendant light in my hallway. The brand was Original BTC and the light was the Cranton. It was a hugely popular event and social media was flooded with posts talking about the designs and products within the house, the Cranton being an extremely popular subject choice. A bone china pendant, it was a statement piece in the living area of the house and it was love at first sight. Moving on a couple of months, and this glorious pendant is now lighting up my hallway. It's the perfect foil for the white walls and the pale pink door and it looks as good unlit as it does with a glow. Heaven. Original BTC are renowned for their classically stylish design. Sir Terence Conran has used Original BTC lights for over 20 years and The Conran Shop was one of the first retailers to stock their products. You can find many examples in their restaurants, Hotel's and contract projects. The business is made up of three parts: Original BTC (classic interior lighting, founded in 1990), Davey Lighting (Heritage industrial lighting for interior and exterior, founded in 1885) and finally, Beadlight (specialising in the design and engineering of LED lighting, founded in 1985). They have three factories across the UK, each specialising in a particular production method. Stoke On Trent is home to ceramics, Birmingham produces metal and glass and Oxford is the base for LED. There's three main showrooms - The Design Centre in Chelsea Harbour, Greene Street, New York and Rue Bonaparte, Paris. Original BTC lights are in all the very best locations. From Jesus College, Cambridge to the Royal Pavillion; from The Royal Academy to the Empire State Building, the carefully considered designs and quality production means that they are the first port of call when it comes to large projects. You'll find them in all the coolest Hotel's and venues - The Ace Shoreditch, the Firmdale Hotel Group, Soho House Group, The Hoxton Paris and Spitalfields Market to name a few. And if you're out to eat at Pizza East or Jamie's Italian, the chances are you are dining under an Original BTC light. 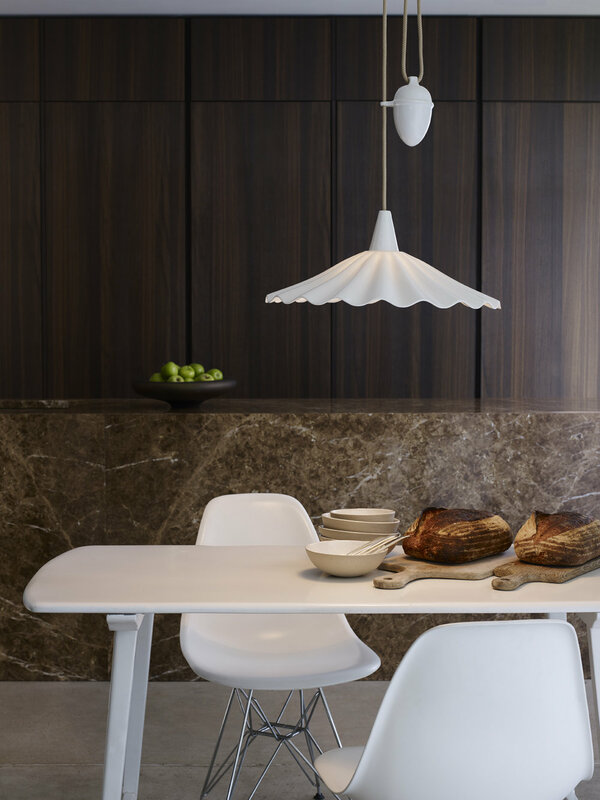 Awarded the Elle Decoration 'Made In Britain' Award in 2012, they've made their stamp on the British design industry. But who is behind Original BTC? Based in Oxford, the company was founded just under 30 years ago by Peter Bowles. With a long family history of creative design and manufacturing, Peter's son, Charlie, started working within the business at just 16. I was interested in learning a little more about him and the company who set the bar so very high when it comes to quality and design in the lighting industry. Charlie Bowles, Director, Original BTC. I’m Charlie Bowles, Director of Original BTC. I’m from Oxford, where our headquarters are based. I come from a long line of designers, manufacturers and retailers, so definitely a case of following in the family’s footsteps! My great grandfather, a carpenter by trade, was chairman of Minty Furniture of Oxford, later bought out by Parker Knoll. After learning the ropes with my great grandfather at Minty, my grandfather launched iconic 1960s lighting retailer Cosmo Designs, employing my then-13 year old father, Peter, on his stand at the Harrogate Lighting Fair. I visited my first factory when I was eight years old and I remember asking to operate the machines. You see forks every day, but at that age particularly, you’d have no idea how they’d be made. I fell in love with the factory’s incredible noise and ‘the making of things’. My first proper job was with Original BTC, assembling Hector lights and also working on the stand at Maison et Objet during the school holidays. From an early age, Peter asked my opinions on new lighting prototypes, so I’ve really felt part of the business for as long as I can remember. I progressed from designing the Original BTC website and brochure whilst studying Product Design at Leeds University to becoming Director in 2012, immersing myself in all areas of the business, from design and manufacturing to sales and marketing, as well as launching and running the Group’s showrooms at Design Centre Chelsea Harbour, Rue Bonaparte in Paris, and Greene Street, Soho, New York. I designed my first light, the London, in 2009 and was absolutely thrilled when it achieved movie star status, with appearances in Skyfall, X Men and Men in Black 3! Who founded Original BTC and how was the idea conceived? Original BTC was founded in 1990 by my father Peter Bowles. At the time, my father owned a cutlery factory, producing a million pieces of own-designed cutlery a year. Challenged by the design limitations of cutlery, he went back to the family roots with an Oxford-based lighting factory. His goal was to design and produce lights that you are instantly at home with, that will fit easily and comfortably for many years to come. Peter was the first designer to use bone china in lighting, paving the way for our investment in British manufacturing. We share a passion for traditional skills, local production, quality materials, functionality and attention to detail. In less than 30 years, Original BTC has grown to become The Original BTC Group, following our 2010 purchase of heritage marine lighting manufacturer Davey and LED lighting brand Beadlight. We had been asked for years whether we were planning to launch outdoor or bathroom-safe lighting. Rather than creating new Original BTC designs, we decided to invest in the purchase of Davey Lighting, a marine lighting manufacturer founded in East India Docks in the 1880s. Its owners were planning to sell it to a Belgian company who were going to outsource production to the Far East, so we were thrilled to have prevented that happening as UK manufacturing is our absolute passion. We invested in a traditional glassworks and metalworks in Birmingham to manufacture Davey’s catalogue of archive designs, which you can now see in many of London’s coolest spots, including the exterior of Spitalfield’s market and round the pool at Shoreditch House. Following the success of our Davey Lighting purchase, we bought Oxford-based LED lighting brand Beadlight, who designed, engineered and manufactured the first ever low-heat, low-power, LED reading light for commercial aircraft. To say those years were busy is something of an understatement, so we were over the moon to have our hard work recognised by winning Elle Decoration’s inaugural ‘Made in Britain’ award in 2012. Our ‘Made in Britain’ ethos is something that has been an integral part of us, from the very beginning. It’s so satisfying to be able to say that the products and components are made in the UK. Over the past few years, a lot of companies have tried to bring production back to the UK, but we’ve been doing it all along. When you say it’s ‘Made in Britain’ – it’s part of you, it’s a heritage – and it’s supporting our industries and our people. Those three words really stand for quality, skill and tradition. One of the great things about Original BTC is that it's a family business. Who's involved? My father Peter is Managing Director of Original BTC, I am Director. Two of my sisters also work in the business; Gina is Director of Beadlight while Hettie manages our Oxford HQ. We try not to talk shop at the dinner table, but it’s pretty hard not to! I think my mother gave up trying to stop us years ago. It’s really very nice working with my father and sisters. We know we can rely on each other. Nobody just glides along, everyone puts in so much and we all work extremely hard. Although, so do the rest of our team! Were you always going to join the family business? I was 16 or 17 when I started working for Original BTC. I remember missing the first day back in my final school year because I was doing Maison et Objet. At University, I was doing the shows as well. I missed whole weeks and I got in trouble, but it was worth it. I progressed from designing the Original BTC website and brochure whilst studying Product Design at Leeds University. I joined the business officially in 2008, but we’d never really discussed it before. I wanted to do something, to be able to make a difference for myself. I just tried hard at university, and then one day I was sitting in the pub with Peter chatting and he said that if I wanted to come on board, I could… he said he thought we could do really well… I said yes there and then. A big part of it was not being ‘given’ anything – I wanted to feel I’d earned everything. The production of bone china products in Stoke On Trent. As well as in the UK, you have offices in New York and France. Where do you spend most of your time? I spend my time between our headquarters in Oxford and our showroom at Design Centre Chelsea Harbour. I also travel a lot, visiting our showrooms in Paris and New York as well as exhibiting at global design fairs including ICFF New York and the Stockholm Furniture Fair. It’s really fantastic that our lights are so well received internationally – we actually export around 50% of our production overseas, which is pretty rare for a British manufacturer. We were very proud to have won The Queen’s Award for Excellence in Export to recognise our achievements – and it goes without saying, I loved meeting The Queen! I spend most of my days in the design studios at our showroom at Design Centre Chelsea Harbour. My days vary hugely dependent on what I’m working on, jumping from sales to designing new collections to looking after the website – who says men can’t multi task! What is the ethos behind Original BTC? Innovation, authenticity and attention to detail are at the heart of our three lighting brands, with inspiration drawn from the materials and production process itself. With the production process managed in-house using highly skilled and labour-intensive processes, each and every light is made to last. 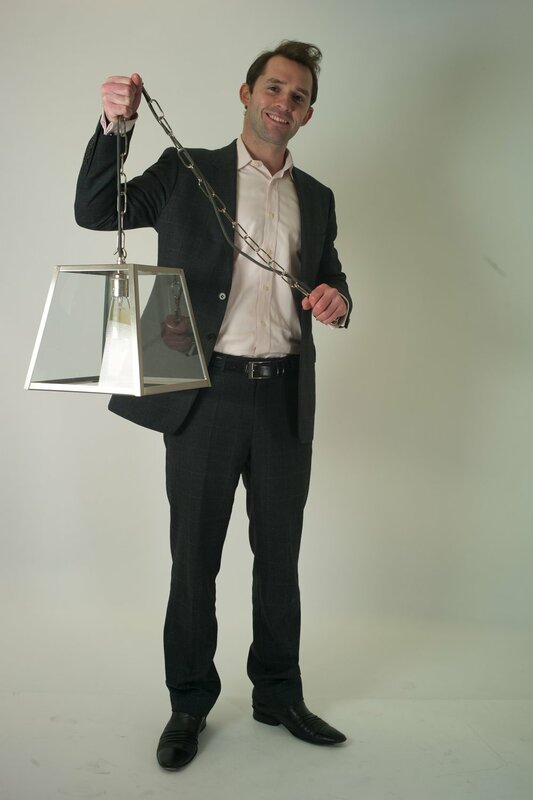 With manufacturing capabilities ranging from centuries-old glass blowing techniques to the latest in LED innovation, our focus is ensuring our growing library is a world-class source of British-manufactured lighting designs. How do you retail your products? We sell our lights directly to customers from our own website and to trade (interior designers and architects) through our showrooms. We’ve worked on some really fantastic projects. 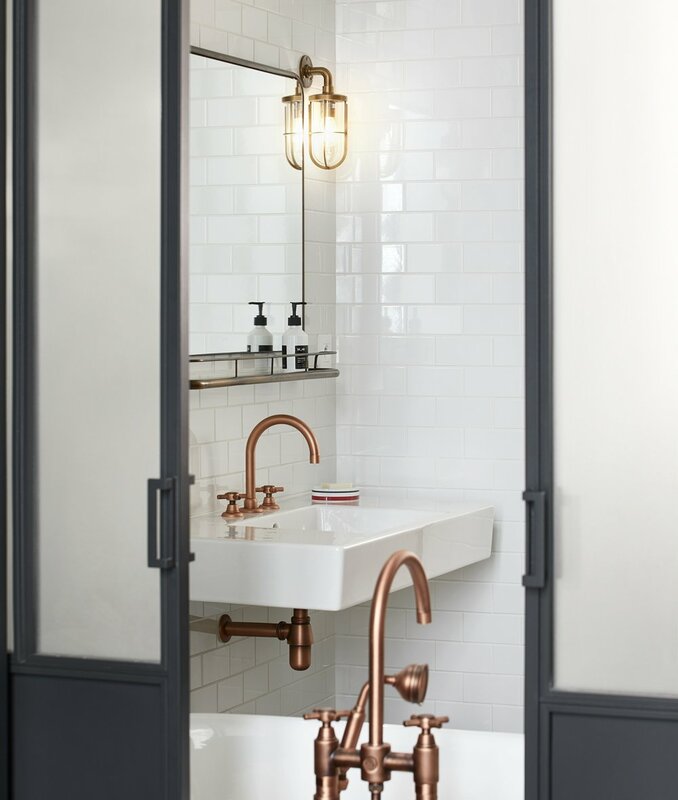 Just in terms of hotels alone, we’ve supplied lights to The Four Seasons, The Savoy, Firmdale Hotels, The Soho House Group - most recently Soho Farmhouse and Cecconis Brooklyn - The Hoxton Paris and The Ace Hotel London. We also have quite a few global distributors. Our lights are particularly popular in Scandinavia and Australia as they seem to capture the laid back Aussie look perfectly! Then, we have our network of retailers which ranges from John Lewis, Harrods, The Conran Shop and SCP to international retailers including Merci, Galeries Lafayette and the Bon Marche in Paris and Design Within Reach across the US. Tell me a bit about the product range. 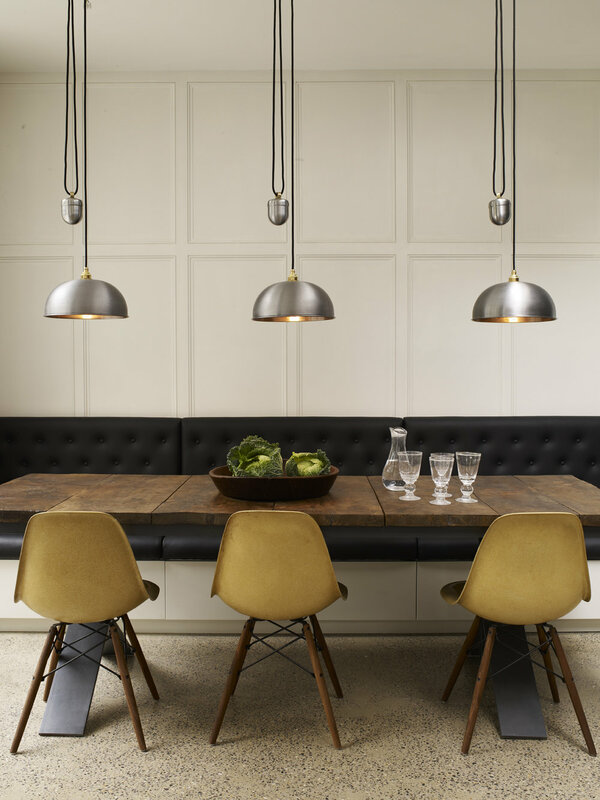 Hand-assembled in Oxford from the finest bone china, metal and glass, Original BTC’s collection of table, floor, wall and pendant lights is instantly comfortable, unassumingly elegant and accessibly priced. The comprehensive lighting catalogue includes utilitarian, statement and stripped back designs, united by a focus on longevity, craft and a passion for pushing the boundaries of production. Quality, detail and mix of materials is key. 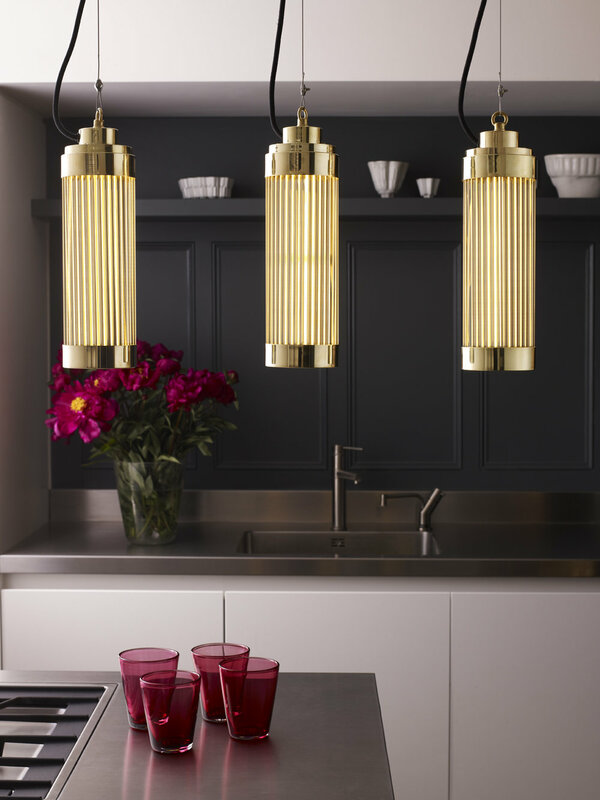 Metal shades and bases are hand-spun in the heart of the country’s metal-working industry, bone china shades are hand-cast in Stoke-on-Trent and glass shades are hand-blown in Birmingham, offset by our signature matching cotton braided flex. That’s quite a funny story actually – Peter was designing a light in the early days and wasn’t keen on the finish of commonly-used plastic lighting flex, so he replaced it with woven cotton braid snipped off the family iron. It soon became one of Original BTC’s best-loved and instantly recognised design features and we now have our own machine to weave the cable with, so the iron is safe! The production of glass and metal products in Birmingham. Where do you find new product inspiration? Peter and I design new ranges together, mostly inspired by the capabilities of our factory. It’s fantastic being able to push the boundaries, without anyone telling you ‘no, it’s not possible.’ Our Hatton bone china collection, for example, is an absolute feat of manufacturing and really pushed the material – and our factory workers – to the very limit. But what a beautiful result! Our recent focus has been combining the skills and aesthetics of our three brands – we’ve started to incorporate Beadlight LED technology into designs for both Original BTC and Davey and we’ve softened Davey’s often rugged aesthetic with more glamorous touches, so hand blown anthracite glass from our Birmingham factory and bone china details from Stoke. We’re also very much inspired by our customers. As Peter and I both work on the stand at our trade shows, we’re very much in touch with what our customers are looking for. We’ve been asked for years for a picture light but we don’t rush into designs until the time is right. We launched our first picture light, the Cooper, this year and we’re delighted with the positive feedback. We only ever design products we love and we’re proud to say everything we make has character and history. The Cranton is hanging in my hallway and I love it! Who came up with the concept of this beautiful light? My father Peter designed the Cranton. We wanted to create a real statement piece for larger spaces, which wasn’t something we had in the range. It’s a similar look to our Pembridge, but on a larger scale. Although it’s a softer, more decorative look than most of our usual styles, it features all our signature touches – the bone china and braided cable, of course, plus the attention to detail that we’re really known for. If you look closely, you’ll see the hexagonal discs match the hexagonal shape of the frame. We've an exciting competition this weekend to win a classic Hector light. Can you tell me a bit about this fabulous design? The bone china Hector was my father Peter’s first design for Original BTC, in 1990. Fascinated by bone china’s translucency and versatility, Peter was the first designer to use it for lighting. Of course, as a passionate supporter of Made in Britain, there was no other place to go than Stoke, the traditional heart of the country’s ceramics industry. But when Peter first approached a Stoke factory with his designs, they took a little convincing – they were accustomed to producing tableware only, so they must have thought his request was a little strange! 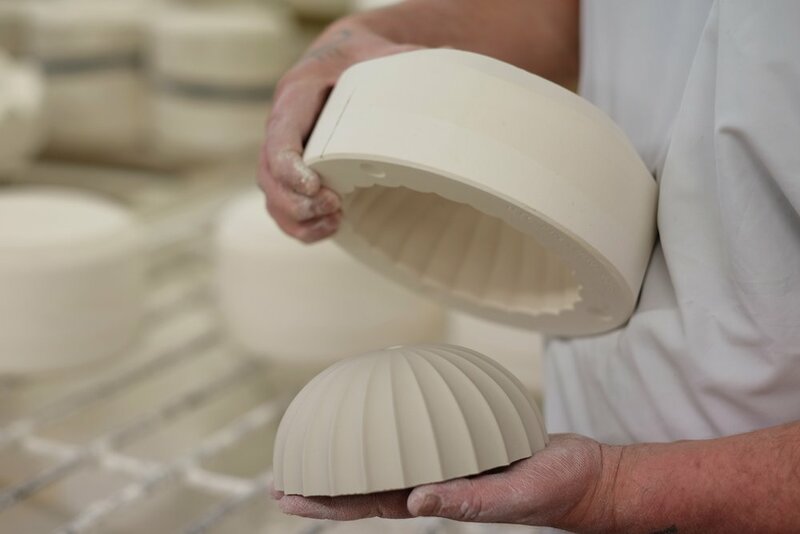 Despite initial reservations, their skill and expertise helped create a beautifully crafted collection of hand-cast bone china lights, which were snapped up by designers and retailers including Sir Terence Conran, who was a very early supporter of Original BTC. When a visit to the factory revealed it was under threat of closure he promptly took on the business, including all staff, whose years of experience would otherwise be lost. With the tide turning towards cheaper overseas production, Peter was determined to go against the flow, with the aim of safeguarding local manufacturing, ensuring efficient supply lines and offering an entirely British-made product. Today, the factory is our lifeblood, producing the bone china components synonymous with many of our best-loved designs, including the Hector, Drop, Pembridge and Cosmo. Nearly thirty years old, the Hector light has reached design classic status and sums up our aesthetic perfectly – well-finished, attention to detail, clean lines and clean to the eye, with a deceptive simplicity. Its simple elegance is what keeps it looking so fresh and we’re always amazed to see how differently our customers style it. Charlie Bowles, Director and his father, Peter Bowles, Managing Director, Original BTC. What advice would you give to a small business? The more hours you put in, the more you’ll achieve! Also, think about structure and processes right from the start – that helps hugely. So what is the future for Original BTC? There’s such a huge appetite for our lights abroad, so we’re looking to open further international showrooms. Watch this space! And finally... Totally non related, but what would be your dream day, money and travel no object? Relaxing in the sun with my wife and daughter, preferable on an island somewhere very far away! With many thanks to Charlie Bowles for taking the time to answer my questions. If you use code LISAD prior to 30 April 2018, you will receive 15% off Original BTC products site wide. Enter code at checkout. 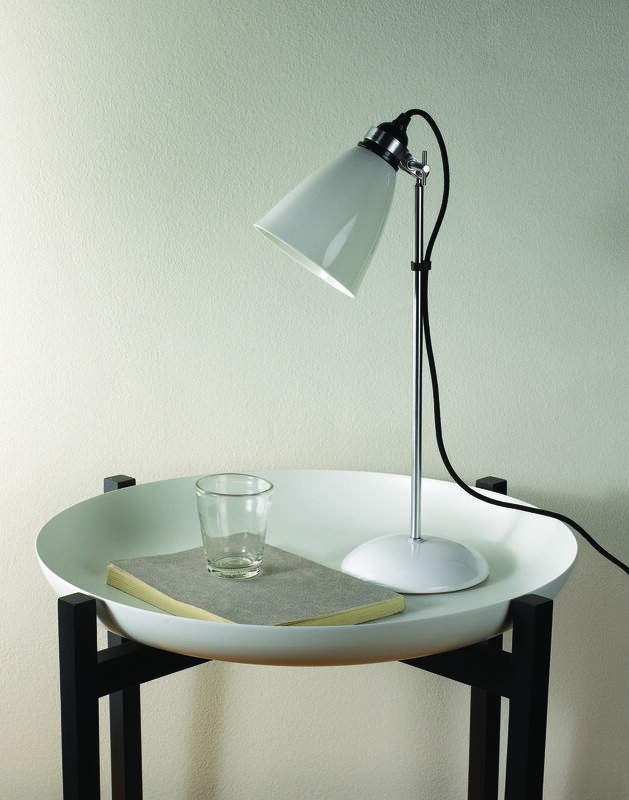 If you click here you can enter a competition to WIN an iconic Hector light. Competition closes Monday 2 April 2018.